Deal Physical damage to target enemy and gain Protection Up (50%) for 2 turns. Dispel all buffs on target enemy, with a 70% chance to remove 30% Turn Meter and inflict Healing Immunity for 2 turns, which can't be Evaded. Also inflict Ability Block on target enemy for 2 turns, which can't be Evaded or Resisted. 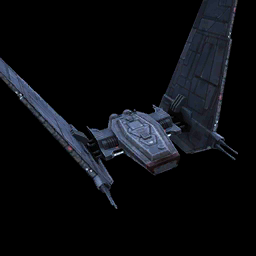 Enter Battle: Kylo Ren's Command Shuttle removes 20% Turn Meter from enemy ships when they are called in as Reinforcements. Kylo Ren's Command Shuttle gains 20% Turn Meter when an enemy reinforces, other First Order allies gain half of that amount. Target ally gains 100% Turn Meter and Advantage for 1 turn, and their cooldowns are reduced by 1, but they lose 20% Protection. Target ally loses all Turn Meter, then all allies gain 40% Turn Meter, plus 25% of the Turn Meter that ally lost (doubled for First Order allies). If the Command Shuttle targets itself, First Order allies gain Advantage for 2 turns. Kylo Ren's Command Shuttle has +40 Speed while it has Protection and +100% Counter Chance while it doesn't. When another First Order ally takes damage, Kylo Ren's Command Shuttle gains 15% Turn Meter and all his cooldowns are reduced by 1.